A brief quote from the forward of Markings is the only commentary necessary for our current civil servants as well as aspiring peacemakers in our world. 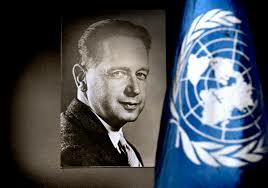 A reader of Markings may well be surprised by what it does not contain - that Dag Hammarskjöld should not make a single direct reference to his career as an international civil servant, to the persons he met, or the historical events of his time in which he played an important role- but if he is surprised by what it does contain, then he cannot have read the credo which, shortly after his appointment as Secretary General, Hammarskjöld wrote for a radio program of Edward Murrow's. From generations of soldiers and government officials on my father's side I inherited a belief that no life was more satisfactory than one of selfless service to your country or humanity. This service required a sacrifice of all personal interests, but likewise the courage to stand up unflinchingly for your convictions. From scholars and clergymen on my mother's side I inherited a belief that, in the very radical sense of the Gospels, all men were equals as children of God, and should be met and treated by us as our masters. Translated from Swedish by Leif Sjoberg & W.H. Auden. Forward by W. H. Auden. Offspring of the past, pregnant with the future, the present moment, nevertheless, always exist in eternity - always in eternity as the point of intersection between time and the timeless of faith, and therefore, as the moment of freedom from past and future.